Gorgeous 4 bdrm, 3.5 bth hm situated on beautifully landscaped corner lot. FRISCO ISD! Wd flrs throughout most of downstairs. Ideal open flrplan. Impressive kit is chef's dream with granite counters, walkin pantry, SS appliances incl dbl ovens, 36 inch gas cooktop & impressive vent hood. 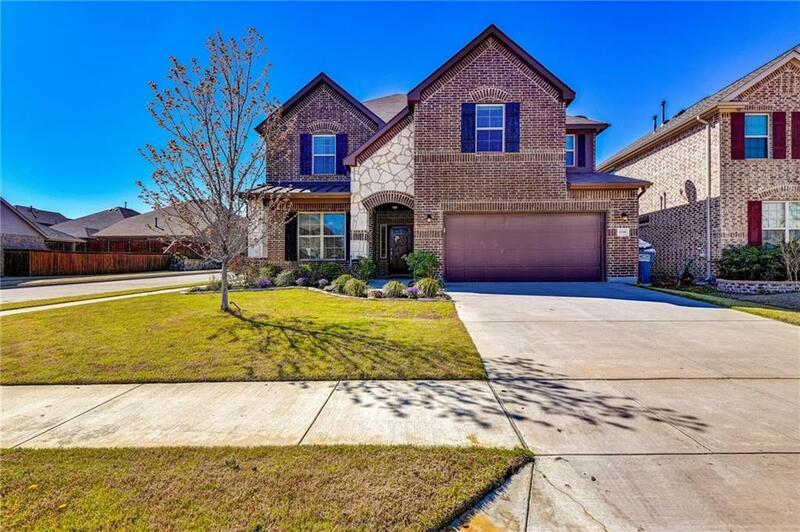 Soaring ceilings, stone fp & tons of natural light in spacious family rm. Other features incl private downstairs master suite w huge walkin closet, study with French drs, neutral paint, upstairs game rm, TONS of storage-floored attic spaces & builtins in storage closet & add upgrades throughout. Relaxing bkyd has covered patio & plenty of room for play. Desirable neighborhood with endless amenities & near all the conveniences!